*Based on double occupancy (two to a room). Seats are limited. Air fare is not included in price but is available for purchase. Prices quoted are current as of the date provided by the travel supplier. Please contact Travelers Lane for the most up-to-date information. 314-223-1224. Thank you. Please call 314.223.1224 to complete your reservation. When you think of an Eastern Europe vacation, what comes to mind? Perhaps it’s visiting old churches and seeing historical sights that have been standing for many centuries. Perhaps you think of visiting cities bombed in World War II and restored to their earlier splendor. Or maybe you think of learning about the counties’ rich histories. If so, this Best of Eastern Europe tour includes all of that and more with overnights in Berlin, Warsaw, Krakow, Budapest, Vienna, and Prague. Your guided sightseeing in the capitals includes the must-see attractions. Visit Berlin’s Kaiser Wilhelm Memorial Church, today a symbol of reconciliation. 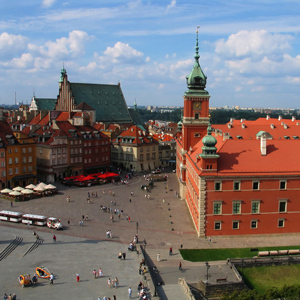 Visit the medieval Old Quarter and the 14th-century Cathedral of St. John in Warsaw. Visit the St. Stephen’s Cathedral in Vienna; the Hradčany Castle grounds and Astronomical Clock, built in 1410, in Prague; and the Kazimierz Quarter in Krakow, where you’ll visit the Remuh Synagogue and the Jewish cemetery, which had its first burials in 1551. Then visit Budapest’s 13th-century Matthias Coronation Church, coronation spot of several Hungarian monarchs. You’ll stop in Auschwitz to visit what is left of the concentration camp. Plus, we have arranged some special experiences in some of the smaller towns. You’ll enjoy special lunches in Donovaly, a popular ski resort in the Tatra Mountains, and in Telc, one of the most beautiful towns in the Czech Republic. All of this and more—including a private Chopin concert in his hometown of Warsaw—are included on this fabulous Eastern Europe tour. Welcome to Berlin! At 6 pm, meet your Tour Director and traveling companions for a welcome dinner at your hotel. Sightseeing with a Local Guide in the once-divided metropolis includes the Ku’damm, the restored Reichstag, a picture stop at monumental Brandenburg Gate and the Holocaust Memorial, Charlottenburg Palace, and the 210-foot Victory Column in the vast Tiergarten park. Visit the KAISER WILHELM MEMORIAL CHURCH (on Sunday, inside guided visit not possible), drive along Unter den Linden boulevard, and pass the German State Opera House and Checkpoint Charlie. To enhance your stay, why not join an optional excursion to historic Potsdam? Cross the Polish border, enjoy vistas of rural life in the fertile central plains, and take a break in the historic river port of Poznan on your way to Warsaw. Your Local Guide will tell you about the tormented, often tragic history of this important gateway city between East and West. See the medieval Stare Miasto (Old Quarter) with its market square and 14th-century CATHEDRAL OF ST. JOHN, the “wedding cake” Palace of Culture and Science, neoclassical Lazienki Palace, and the remnants of the Jewish ghetto. Later, attend a private CHOPIN CONCERT. A fascinating morning: visit JASNA GÓRA, the monastery near Czestochowa, and admire its BLACK MADONNA, which is venerated as the “Queen of Poland” and has become the country’s national symbol. Next, stop in Auschwitz to visit what is left of the CONCENTRATION CAMP, a chilling reminder of the Holocaust. Evening arrival in Krakow. Morning guided sightseeing in ancient Krakow features a visit to ST. MARY’S CHURCH. Take pictures of impressive Wawel Royal Castle, and drive past the Oscar Schindler Factory. Then, enjoy a walking tour of KAZIMIERZ QUARTER, visit the area where scenes of the movie Schindler’s List were filmed, and visit the REMUH SYNAGOGUE and the Jewish cemetery. How about tonight’s optional Polish dinner and folklore show? A scenic drive through the heart of mountainous and densely wooded Slovakia, where brown bears still roam free, brings you to Donovaly, a popular ski-resort in the Tatra Mountains, where lunch has been prepared for you. Continue to Budapest, proud capital of Hungary. This evening, you may wish to join an optional private dinner cruise on the Danube River, the perfect introduction to this fascinating city. Your Local Guide takes you through Eastern Europe’s most cosmopolitan city. See elegant Andrassy Avenue, the Thermal Baths, and the world’s second-largest Jewish synagogue. 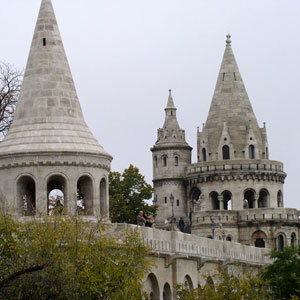 From the lacy lookout towers of Fishermen’s Bastion, enjoy a panoramic view of the sprawling city. Then, visit the 13th-century MATTHIAS CORONATION CHURCH and Heroes’ Square. Afternoon at leisure. Tonight, a delectable optional Hungarian specialty dinner can be arranged. Drive through the Hungarian plains to Vienna, once the center of the mighty Habsburg Empire. Meet your Local Guide and start your sightseeing with vistas of Prater park with its giant Ferris wheel. Then, drive along the elegant Ringstrasse. Pass the impressive State Opera House, the Jewish quarter, and stop at the Hofburg Palace, winter residence of the Austrian imperial family. Marvel at the impressive courtyards and famous Heldenplatz, and visit awesome ST. STEPHEN’S CATHEDRAL. A whole day at leisure offers you the opportunity to join exciting optional excursions to the capital of Slovakia, Bratislava, and a concert in one of Vienna’s concert halls, or to just explore this magnificent city on your own. Cross the Czech border and enter Moravia. Stop in one of the most beautiful towns in the Czech Republic, Telc, where a special lunch with local specialties awaits you. In the afternoon, drive through the rich farmlands of Moravia and Bohemia to Prague. Tonight is your chance to join an optional outing to explore Prague by night. Guided sightseeing includes a visit to HRADČANY CASTLE GROUNDS. Also see St. Vitus Cathedral, the Old Town, the Jewish ghetto, and the ASTRONOMICAL CLOCK, once the envy of all Europe. Balance of the day at leisure. Re-enter Germany and stop in Dresden, the former capital of Saxony. Badly damaged by Allied bombing in February 1945, the city has since been restored to its baroque splendor. During your walking tour, admire the architecture of the Zwinger Palace and Semper Opera. Next, return to Berlin, where a special farewell dinner with wine awaits you at a local restaurant. Located in the historic city center; close to shopping & attractions; hotel has an on-site Italian restaurant & bi-lingual staff. Facing historic Pilsudski square and the majestic Saxon Gardens, a short stroll from the Old Town and Royal Castle, the monumental Sofitel Warsaw Victoria places Poland¿s culture rich capital on your doorstep. Its sober geometric facade gives way to a stunningly modern 70s inspired interior, the epitome of contemporary French elegance and sophistication. Opposite Philharmonic Cracovia – 2 min walk to main Market Square – 5 min walk to Royal Castle Wawel – 15 km to Balice Airport. This contemporary 230 room property offers modern luxury. Free Wi-Fi access is available in the hotel lobby and café. For relaxation there is a top floor fitness centre with panoramic views and a sauna. The main restaurant serves international food and Hungarian specialities and the cosmopolitan café has an outdoor terrace on which drinks and snacks can be enjoyed. The informal hotel bar has a good selection of beverages and cocktails. An elegant 309 room hotel, dedicated to Prince Eugene of Savoy and housed in the former State Austrian Printing House with a modern, glassy atrium. Amenities include a fitness area, sauna and steam room, two restaurants and a jazzy bar. This contemporary design hotel has198 modern air-conditioned guest rooms with satellite TV, minibar and safe. The unique Restaurant & Café Bar offers a great choice of noodle orientated cuisine from all over the world along with local specialties, desserts, drinks and cocktails served throughout the day. Other amenities include free internet connection and a small fitness room. The following list of optional excursions are examples only for this vacation. These optional excursions might or might not be offered. Whether it’s a special dinner, a local show or a special behind-the-scenes glimpse into an historical site, optional excursions are a wonderful way to enrich your vacation even further. Plus, they give you flexibility. We include the must-see sites and experiences, and we also understand that people take interest in different activities and may want to craft a more personal vacation by hand-picking optional excursions that appeal to them. Availability is subject to sufficient participation, weather conditions, seasonal suitability, days of operation, group interests, and general feasibility for your vacation. The approximate value listed gives you a good, general idea of what you can expect to pay but may vary once you are on your vacation. Some information provided might be in a foreign currency; to get an estimated price, use a currency converter for exchange rate information (pricing may vary at the time of booking). Once you have booked your vacation, Globus provides the ability to pre-purchase excursions, register for your vacations and provide emergency contact information online. Excursion to Potsdam Stroll through the stunning gardens of Sanssouci Palace. Visit Cecilienhof Palace, the last palace built by the Hohenzollern dynasty, erected in the early 19th century for Crown Prince Wilhelm and his wife Cecilie von Mecklenburg-Schwerin, the architecture emulates the English Tudor style. This historical building was used by the allied heads of state US President Truman, the Soviet leader Stalin and British Prime ministers Churchill & Attlee in the summer of 1945, for the famous Potsdam Conference, where the victorious Allies of World War II discussed peace treaties and post-war order. There is also a chance to see the Glienicker Brücke, the bridge that connects the state capital of Potsdam with the federal capital of Berlin. This was one of the most renowned monuments of the Cold War up to the fall of the Berlin Wall. Until the political change in 1989, the bridge also known as “The Bridge of Spies” was the location of the famous spy-swaps of FBI and KGB secret agents between the US and the Soviet Union. Royal Castle Together with your local guide, explore the beautiful Royal Castle. The history of this palace goes back to the 14th century when the Great Tower was erected. In the 16th and 17th century during the reign of Sigismund III Vasa, the Castle underwent large-scale expansion and was transformed into a 5-winged edifice with an inner country yard. In September 1939 the Castle was bombed by the Germans; however musicologists under the leadership of Prof. Stanislav Lorentz, managed to salvage some elements of the interiors and also some of the works of arts. In September 1944 the Castle was blown up by the Germany army and in 1984 the reconstructed interiors were opened to the general publics. Polka Party with Dinner The Polka is a Central European dance originated in the middle of the 19th century in Bohemia. Tonight, why not join your Tour Director and traveling companions for an authentic Polish evening? Savor a 4-course meal with coffee and wine included. Original home-style entertainment has been organized whilst dining. At the end of the show you will have the chance to join in the fun! World Famous Wieliczka Salt Mines Europe’s oldest salt mines and considered to be one of the world’s wonders. The Wieliczka salt mine is still operative, reaching a depth of 327 meters (1,073 ft) and is over 300 kilometers (190 mi) long. The rock salt is naturally grey in various shades, resembling unpolished granite rather than the white crystalline look that many visitors may expect. The mine’s attractions include dozens of impressive statues and an entire chapel that has been hand carved out of the rock salt by the miners. A visit to this thousand-year-old salt “theme park” will be a memorable experience! Danube Cruise and Dinner Cruise along the Danube River, and enjoy a typical Hungarian buffet dinner and drinks on board. Admire spectacular views such as Margaret Island, a green oasis in the middle of the river; the House of Parliament; Castle Hill with Fisherman’s Bastion; the Royal Palace; the Citadel fortress set on the highest point in downtown Budapest; and the university. Hungarian Dinner The Hungarian cuisine is a prominent feature of the Hungarian culture, just like the art of hospitality. Tonight, spend a pleasant evening in a traditional restaurant and enjoy a typical 3-course dinner with coffee and two drinks. Join your Tour Director for this special evening …this is your chance to try the famous goulash or to select a dish from the international menu. Best of Mozart and Strauss Attend a concert in one of the most beautiful concert halls in Vienna. The costumed orchestra performs well-known arias composed by Mozart as well as famous pieces like The Blue Danube Waltz and The Radetzky March by Strauss. Opera singers and a soloist add to the ambiance of the evening. Excursion to Bratislava Drive to Bratislava, the economic and political center of the Slovakian Republic, and enjoy a beautiful panoramic view from the castle. Also, walk with a local expert through the streets of the medieval Old Town and visit gothic St. Martin’s Cathedral or the Primate’s Palace. Time at leisure to shop on the main square. Heurigen Dinner Enjoy dinner with music and wine at one of the Heurigen (wine taverns) in the wine-growing area of the Vienna Woods. A Heuriger is a tavern that serves its own wine from the current harvest year and traditional fare such as Wienerschnitzel and Apfelstrudel. Moldau Cruise with Lunch Enjoy an aperitif, buffet lunch with drinks, and live music as you cruise down the Moldau River. On your 1½- hour journey, glide past the historical center of Prague, admire 9th-century Prague Castle, former residence of Czech rulers; St. Vitus Cathedral; famous 14th-century Charles Bridge; Petrin with its Lookout Tower bearing a strong resemblance to the famed Eiffel Tower; the National Theater, built with donations from Prague residents; Vysehrad Castle; and Slavin Cemetery, where many famous Czech personalities are entombed. Prague By Night On this evening guided tour, learn the legends of this fascinating city while enjoying spectacular views. Stroll along the cobblestone lanes in the Old Town, stopping at a local tavern to taste famous Czech beer and to listen to traditional melodies. The evening highlight is a walk across the illuminated 14th-century Charles Bridge, a popular spot for Czech artists and musicians, and from where you can admire a magnificent view of Prague Castle. Schoenbrunn Palace One of Europe’s most impressive baroque palace complexes, a UNESCO World Heritage Site, and former summer residence of the imperial family, Schönbrunn was originally built in 1642 and later redesigned from the ground up by Empress Maria Theresa. The dazzling residential apartments and state rooms with their original furnishings and decorations, and the impressive park and gardens surrounding the palace, convey an authentic impression of the imperial lifestyle. The purchase of any travel services offered by the tour company constitutes a contractual arrangement between you (the Traveler) and the tour company and represents your acceptance of the Terms & Conditions. Please ensure that you read carefully and understand the Terms & Conditions prior to booking. These Terms & Conditions cover Deposit & Final Payment information, Air-Inclusive Deposits & Final Payment, Revisions & Revision Fees, Air Arrangements, Participation, Travelers Who Need Special Assistance, Young Travelers, Smoking, Price Policy, Visas and Passports, Hotels & Accommodations, Baggage Allowance, Travel Documents, Not Included in the Land Price, Refunds, Service Inquires After the Vacation, Holidays, Safety, Photos & Pictures, Optional Excursions, and Responsibility. o Vacation departures, itineraries and prices are subject to change. o A non-refundable, non-transferable deposit is required for the tour company to reserve space for you. View Terms & Conditions for limited exceptions. o The following charges are not included in the land vacation price unless otherwise noted: airfare to and from the start of your vacation; Intra-vacation air unless specified in the itinerary; airline baggage fees including checked and/or excess baggage fees; Federal inspection fees for the Federal U.S. Customs and Immigrations; International Air Transportation tax; agricultural tax; other per person taxes imposed by government entities; airport taxes and fees including the September 11th Security fee up to $10 per person, passenger facility charges up to $18 per person, Federal domestic flight segment fees up to $3.70 per segment, and U.S. and International arrival and departure and other government-imposed added by the airline and applicable at time of booking; port taxes; passports; visas (except on Cuba programs) and vaccinations; tips to your Tour or Cruise Director, the tour company Group Leader in Cuba, Local Host, driver, Local Guides, and/or ship’s crew; gratuities on ferries, trains, and cruise ships; laundry; telephone; minibar; alcohol, beverages, and food outside of the contracted Globus menu as presented at a hotel or restaurant or onboard your vessel (these extra items will be billed to you before leaving the hotel, ship, or restaurant); airport transfers on non-qualifying flights; optional excursions; additional activities and excursions purchased online; porterage at airports and train stations; Travel Protection; and all other items of a personal nature. Booking your Vacation with Air For air departure dates within 331 days, you’ll be offered a choice of carriers and flight schedules as well as price points to choose from when selecting your flights. Your schedule will be provided to you at the time of booking (schedules are subject to change by carriers). The tour company offers 2 air options: Flex Air and Instant Purchase Air. Flex Air allows flexibility if you want to make changes to your vacation schedule. Instant Purchase Air may offer additional airline options but has more restrictions. Some vacations may only offer one Air type option. Guaranteed air-inclusive prices: air is only available to passengers traveling from the United States and only available when booked in conjunction with a land vacation. An additional $300 per person non-refundable air deposit is required for Flex Air booked in conjunction with any land vacation (i.e. air-inclusive vacation). Air can only be booked by the tour company in conjunction with a vacation package. Instant Purchase Air requires air payment in full at time of booking (i.e. air-inclusive vacation) plus non-refundable service fee ($30 per person for North America, $50 per person for International air). Once booked, Instant Purchase Air is non-refundable, and non-changeable. Some vacations may only offer one Air type option. However, once your airfare is confirmed and the tour company has received your full air and land deposit, your air-inclusive vacation price is guaranteed. return travel from some countries, international travelers are required to pay entry and/or exit fees at the airport. These fees will be collected by the local government and are payable by the traveler at time of travel. Your confirmation booking information will contain information about these fees. [LF] – The tour company has created special experiences that will bring you behind the scenes, spotlight the unique stories of your journey, and bring to life the local flavor of your destination. Just look for the “[LF]” to see what we’ve included for you.